As co-chair of the Broadband Commission, President Kagame also thanked the broadband commissioners for their dedication to increasing broadband accessibility. THE RWANDA Stock Exchange’s (RSE) central depository was recently inter-linked with other regional stock markets’ depositories; a move many sector players say will boost activity at the local stock market. In fact the switch was long overdue considering that three out of the five companies trading on the local stock market are cross-listed. The development therefore gives them more opportunities to transact business compared to the previous situation, when they could spend months without trading a single share. It will now be easy to transfer shares across the Rwanda, Kenya, Uganda and Tanzania stock exchange markets. According to RSE officials, transactions involving regional firms will now take less than two hours compared to over three months previously. Things can only get better. However, this development should not be seen as the magic bullet that will solve the challenge of low volumes at the local market, or why companies are reluctant to list on it. The RSE issues need new approaches and innovation so that more investors, especially Rwandans, can get involved and invest in shares of different companies listed on the stock market. Remember, the majority of would-be investors do not understand how the stock market operates. This, therefore, calls for massive sensitisation drives to educate the public, especially business people, the benefits of investing in shares. Last year, when the Capital Markets Authority officials were appearing before Parliament they said they would start massive sensitisation campaigns, but nothing seems to be taking place. Also, CMA had said they were working with local authorities to start issuing Municipal Bonds by end of last year; the public is still waiting. If this initiative kicks off, it would do a lot in creating awareness as more people get involved. China is committed to strengthening the cordial relationship with Rwanda, the Chinese Ambassador to Rwanda, Shen Yongxiang, has said. Yongxiang was speaking at a function organised by the Chinese Community in Rwanda to celebrate the Chinese New Year on Monday. The event was held at the Chinese Embassy in Kigali. “As we mark the Chinese New Year, I want to inform you that we are grateful as China to have a good relationship with this country,” the envoy said. He also hailed government’s support which he said has enabled China to effectively implement its development projects in the country. The Chinese government has for long been supporting Rwanda in various sectors, including agriculture, health and construction sectors, among others. Monday’s event also saw best photographers in a photography contest awarded. The Chinese embassy organised a photography competition dubbed ‘China in the eyes of Rwanda’ that aimed at promoting and exchanging culture between the two countries. Omar Khalfan, a lecturer at the University of Rwanda’s Huye campus, emerged the best in the contest and received a laptop. The second best, Philomena Lindagato, went home with a mobile phone while Timothy Kisambira of The New Times and Faustine Niyigena of Izuba Rirashe, The New Times sister paper, received a camera and an Mp3, respectively. “I am so happy that I emerged the second best photographer. The secret is that I submitted photos in line with culture, the theme of the contest,” Niyigena said. Ambassador Yongxiang appreciated everyone who participated in the contest, adding that each one’s role contributed to the success of the contest. Evictees from Tanzania who are temporarily housed in school structures in Jabana Sector, Gasabo District. The New Times/ John Mbanda. Rwandans who were evicted from Tanzanian will be moved to their permanent homes by March, the Ministry of Disaster Preparedness and Refugees Affairs Permanent Secretary Antoine Ruvebana, said on Monday. Ruvebana said the ministry is providing construction materials while districts are identifying land where to construct the housing units. Over 5,830 evictees were last month temporarily moved from Kiyanzi and Rukara transit centre in the Eastern Province where they had been sheltered after they were banished from Kagera region in neighbouring Tanzania. They are temporarily hosted in various districts in the country. About 14,253 crossed into Rwanda following their controversial expulsion from Tanzania in August. A total of 8,361 have since reunited with their families in various parts of the country. “The next phase is to relocate them from the current temporary residences to permanent homes,” Ruvebana said. He said they had started distributing some scholastic materials to children and were considering providing them with health insurance (Mituelles de santé). Some districts have already commenced the construction of houses for the evictees. All districts were given a three-month period to reintegrate the evictees. Rubavu District mayor Sheikh Hassan Bahame said the process will be completed within two months. “We have already hired a contractor who will work alongside the district,” Bahame said. He said his district will put up 32 houses for the 60 people who were relocated there. Gideon Ruboneza, Ngororero District mayor, said they had identified land in various sectors, including Kavumu, Ngororero and Muhororo where 35 houses for 101 people, currently living in former school buildings in Kavumu sector will be built. He said he is optimistic all the evictees will be resettled in the next two months. Ruboneza said the district is employing the evictees in VUP programmes, a national anti-poverty scheme through which the poor receive support from the government. UN agencies such as World Food Programme, Unicef and United Nations High Commission for Refugees (UNHCR) are providing the evictees with basic necessities. Nyarugenge mayor Solange Mukasonga said those relocated to her district will be resettled in Kanyinya, Mageragere and Nyarugenge sectors. She said 27 houses will be constructed, starting next month. Mukasonga said they held a meeting with stakeholders, including religious leaders, and agreed to monitor and follow up on the evictees on a daily basis to ensure they access basic needs. The European Investment Bank and the I&M bank on Tuesday signed a deal that will see Rwandan small businesses benefit from EUR8 million under the new lending programme for Small and medium sized enterprises (SME’s). This is the second new small business lending programme between the European Investment Bank and I&M Bank Rwanda in seven years. Previously the EIB floated $3 billion. The agreement was signed by Sanjeev Anand, Managing Director of I&M Bank Rwanda and Kurt Simonsen, Head of the European Investment Bank’s regional representation for East and Central Africa. Simonsen said that the I&M bank has proved to be a good and trusted partner over the years and the European Investment Bank (EIB) is confident that the funding will enable Rwandans to attain their economic development strategies. “We are very proud to work with I&M, who have been using the funding appropriately to facilitate economic development in this country. We are very sure that this money will reach the rightful owners and be used well” he said. Managing Director, Sanjeev Anand explained that the SME and corporate sector forms the most important part of I&M Bank’s strategy in Rwanda and that the long-term financing lines provided by EIB will go a long way in facilitating efforts to provide investment support to SMEs. Over the years, the European Investment Bank has extended five small business focused credit lines for a total amount of EUR 31 million to Banque Rwandaise de Développement, Bank of Kigali, and I&M Bank Rwanda Ltd. 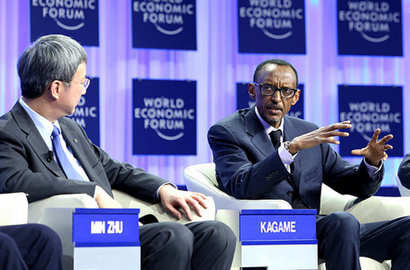 The funds have helped to develop more than 100 SMEs and created more than 1, 250 jobs in the private sector in Rwanda. In addition to supporting small and medium sized companies in the country. The European Investment Bank has signed a credit line with Kenya Commercial Bank to support microfinance and intends to broaden support for private sector investment in Rwanda in the future. The recent discussions between Rwandan and DRC senators have been hailed as good progress in often fractious relationship between the DRC and Rwanda. A group of senators led by Senate President Jean Damascène Nkawukuliryayo were in Congo for three days to discuss security, peace and economic activity of the two countries. According to Senator Jean Damascene Bizimana, chairman of the Foreign Affairs commission, the basis for the 3-day trip was to examine matters pertaining to the implementation of the African Union peace framework signed in Addis Ababa, Ethiopia, early this year. The framework aims at finding ways of bringing peace to eastern DRC. The DRC, according to the Addis accord, has the primary responsibility of pacifying its volatile east, particularly by talking to rebel groups fighting the government. Neighboring states, including Rwanda, are required to help by not getting involved to stir up trouble in the already wrecked region. “We agreed on some things but disagreed on others. The DRC senators accused our government of supporting the M23 based on various reports by the UN Group of experts and other human rights organizations but we have sent detailed rebuttals on those reports, which we showed them,” Sen.Bizimana said, adding that despite such disagreements, the dialogue helped a lot in pacifying relations. The meeting also underscored the importance of neighboring countries reviving their routine discussions at border regions to help get rid of the harmful suspicions and falsehoods propagated by lack of a forum to discuss any issues. In the past few weeks, some heavily armed Congolese soldiers have been arrested after being caught on Rwandan territory and sent back to the DRC. The soldiers claimed that they did not know that they had crossed the border and were on Rwandan territory. President Kagame said during a press briefing that he did not think that the soldiers had crossed the border with knowledge or approval of their government, and that he assumed it was a simple mistake on the soldiers’ part. Among other things, the Congolese Senate has agreed to set up a committee to look into matters pertaining to the welfare and possible homecoming of hundreds of Congolese refugees hosted by Rwanda, “a very positive development and crucial step forward,” according to Sen. Bizimana. During the Kinshasa session, both parties agreed to resume parliamentary diplomacy meetings – alternating in either countries – at once every semester or more if necessary. The Rwandan delegation requested that the next meeting be held in Rubavu, where the Economic Community of Great Lakes Countries (CEPGL) headquarters are based, in December. The meeting in Rubavu, it is hoped, will allow the lawmakers to better examine challenges and possible solutions to the two countries’ joint cross-border development projects including hydro-power generation on Rusizi falls, and the Burundi-DRC-Rwanda road network. Rwandan and Congolese Senators paid attention to, among others, three important but stalled CEPGL projects: the Great Lakes Development Bank (Banque de Développement des Etats des Grands Lacs, BDGL); the agronomical and zootechnical research institute (IRAZ); and the energy development arm of the bloc (CINELAC). The implementation of mutual projects has stalled as there has been no momentum from the three countries, due to political divergences and poor coordination. Most of the blame for the projects failure is currently put on President Joseph Kabila, the current CEPGL Chairperson, who has failed to organize the habitual sessions of Heads of State that guide and direct project execution. Therefore the Rwandan Senators requested their Congolese counterparts to help advocate for such a higher level meeting to be arranged. However, what Sen. Bizimana calls another added advantage, is the fact that Dr. Nkawukuliryayo met with President Kabila for a one-on-one chat. This paper tried raising the Senate President on what they discussed but he did not answer his known phone by press time. “When there are high-level meetings, like this, it is a sign that there is a good chance for resolving issues. It is usually a critical step towards finding solutions,” Sen. Bizimana said. During the May visit, DRC senate president Leon Kengo wa Dondo agreed with his Rwandan counterpart to ensure constant dialogue on matters of mutual interest so as to spur parliamentary ties and help resolve regional conflicts.